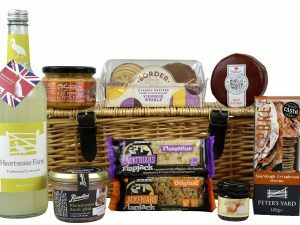 Our food hamper baskets are suitable for a range of budgets, and are brimming with a delightful selection of sweet and savoury food. Packed with cakes, chocolate and confectionery delights, artisan cheese and crackers they’ll certainly create a fabulous impression from the moment they arrive. Discover our Food Hampers, and you’ll find beautifully presented gifts containing a selection of alcoholic and non-alcoholic drinks. They can include champagne, gin, wine and port, or teas, coffee and soft drinks as alcohol-free alternatives. For those that love nothing more than tucking into a cheeseboard, we’ve also created Cheese Hampers for the perfect after-dinner treat. All of our food hampers are made for sharing with loved ones, and every product is lovingly chosen by our experts, from some of our favourite UK brands. If you’re searching for the perfect birthday present, or need something unique for Valentine’s Day, Mother’s Day or Father’s Day, our luxury food gifts are a brilliant way to give a loved one an unforgettable surprise. Our Bakery Gift Basket is brimming full of sweet treats and perfect for sharing with family and friends or even to send to the office. Choose your favourite from our fantastic range of muffins, cakes and flapjack from our favourite Blackfriars Bakery. A basket to delight and will be a winner for everyone. 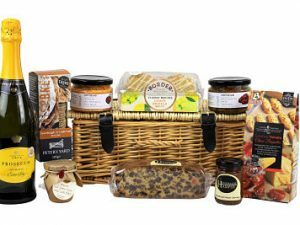 The Classic Food Gift Hamper is a traditional wicker hamper brimming with some everyday kitchen essentials and family favourite food items. The Canterbury Picnic Hamper for Four is an absolute delight. Everything you need to enjoy a stylish picnic. No need to worry about packing as we’ve done it for you. Crockery, glasses tasty bites and your favourite bottle. Just pick the destination and go! The prestigious Chelsea Gift Hamper Basket allows you to choose your favourite luxurious treats to accompany the bottle of your choice to make this a gift of your own creation. Choose from our Award Winning selection of sumptuous foods to make this a gift worth giving! 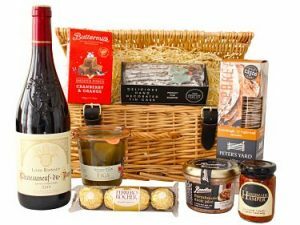 The Cheshire Picnic Food Hamper Basket is a delightful gift for all to enjoy. Crammed full of superb treats to accompany your choice of drink selection. 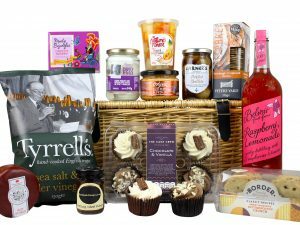 The Cotswold Picnic hamper basket is crammed full of delicious delights for that perfect picnic, Award winning treats to accompany the bottle of your choice. 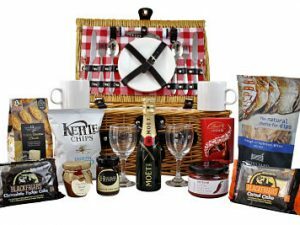 The Oxford Picnic Food Gift Hamper hosts a huge array delicious treats. Award winning cheese and crispbread goes perfectly with the Handmade Hamper Chutney. A sweet treat with the delightful chocolate Viennese whirls or luxurious flapjack. And choose your favourite drink to accompany them. Why wait for summer to enjoy! Enjoy a delightful picnic in the sunshine with The Richmond Picnic Basket. Presented in a dark wicker basket it is teaming with our favourite delicious tasty bites to accompany the bottle of your choice.